A 99-year leasehold site at the corner of Commonwealth Avenue and Margaret Drive is on the market for $200 mil. The site’s tenure started on January 1 1975, and the 32,305 sq ft vacant plot used to be the site of the former Queenstown Cinema. Cushman & Wakefield (C&W) is the marketing agent for the sale. 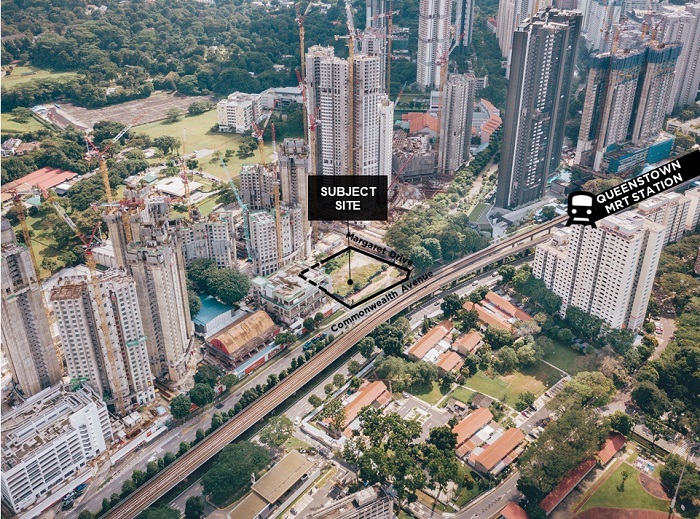 Located 300m to the Queenstown MRT station, the site has been granted Written Permission to be developed into a six-storey commercial building comprising shops, restaurants, community institutions, and a cineplex with basement car parking lots. The approved gross floor area (GFA) is 96,914 sq ft, and no development charge is payable. The current asking price translates to $2,063 psf over the approved GFA. “The immediate neighbourhood of the subject site is undergoing massive rejuvenation with multiple new condominium developments such as Stirling Residences, Margaret Ville, Commonwealth Towers and Queens Peak, as well as new public housing projects including SkyOasis @ Dawson, Skyresidence @ Dawson, Skyville @ Dawson and Skypac @ Dawson,” says Shaun Poh, executive director of capital markets at C&W. The site for sale is the only commercial site available on the market in the area, and when completed, it would cater to more than 17,000 households around the new and existing residential developments in the area, he adds. The tender closes on Jan 8 2019.